Taking risks is never easy and it’s rarely simple. An endless dance takes place in which a balance of risk and reward must be struck. 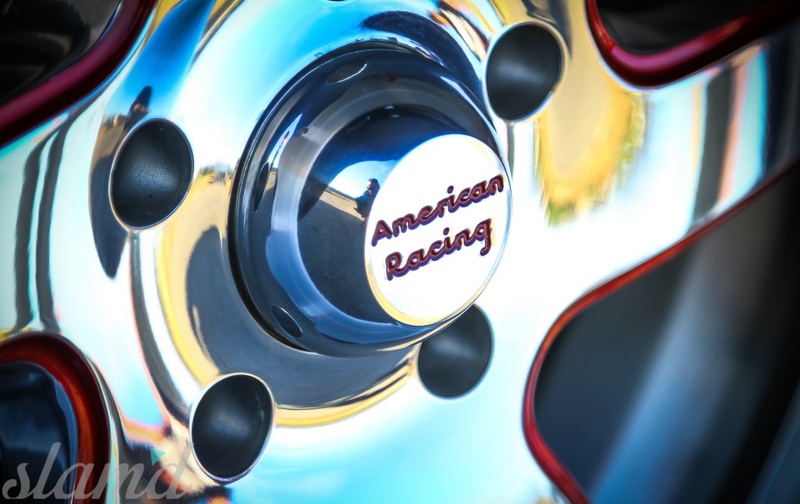 For TMI Interior Products, few events have presented risk like SEMA. 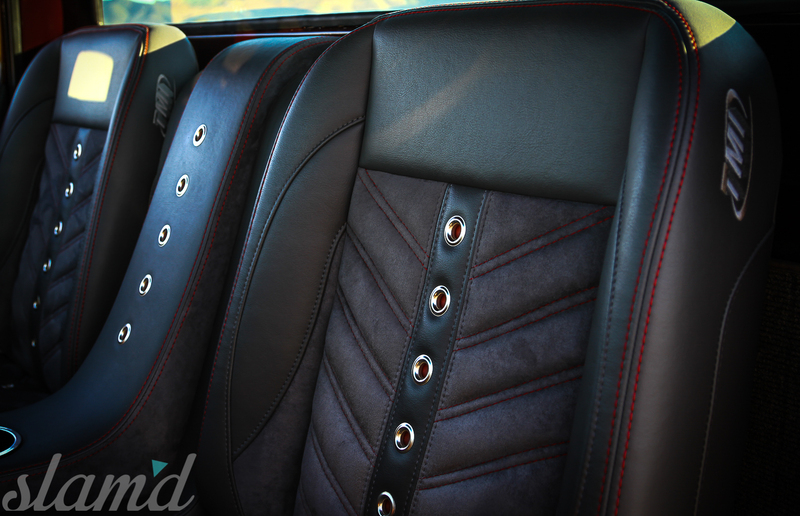 However, the badass interior/restoration brand knew that in order to continue to innovate in the interior restoration industry, that they must adapt and grow. 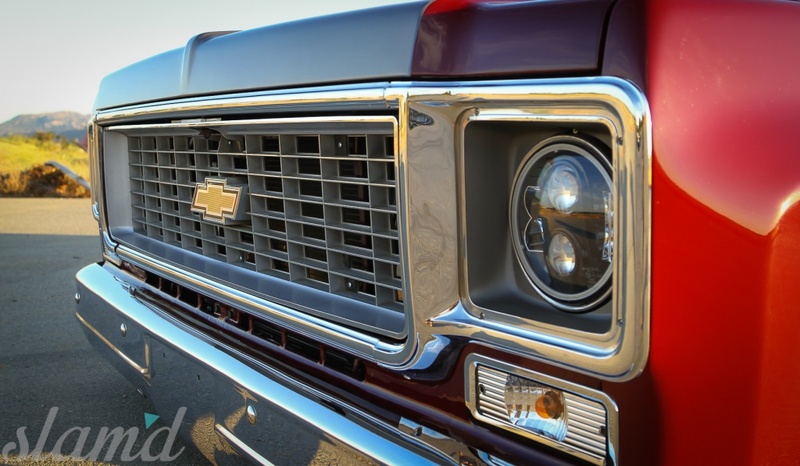 The classic truck market was one that had been steadily expanding, yet TMI had yet to make its mark. Larry Ashley, marketing Director for TMI, saw the opportunity to enter a new corner of the market and he refused to just tip toe into the shallow water. 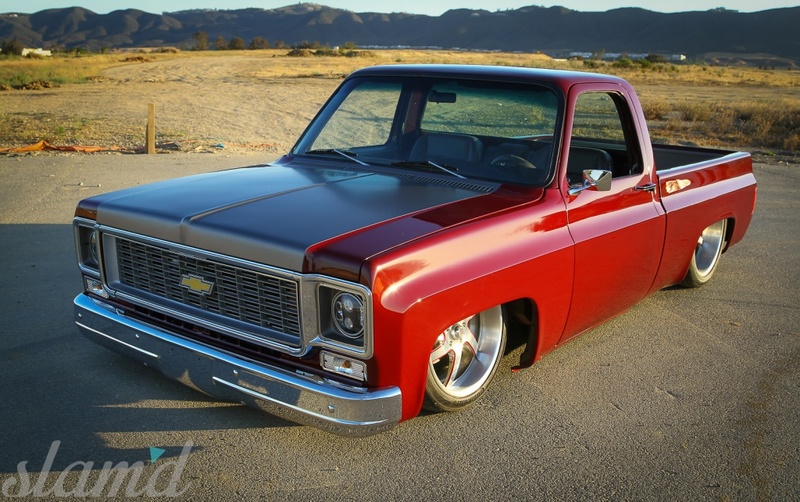 Larry tacked down the perfect candidate to show TMI’s aptitude in the classic truck genre and jumped straight into the deep end. 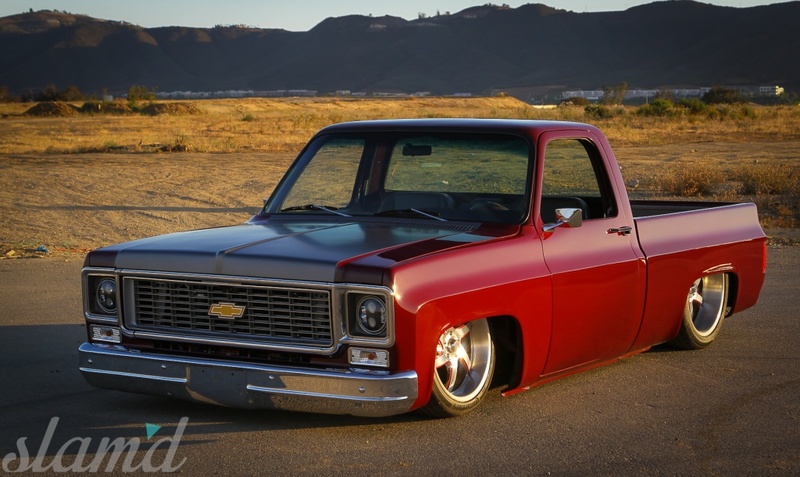 He found a 1973 Chevy C10, already the project of a longtime industry friend. The truck’s transformation to a Slam’d masterpiece was in its infant stages. 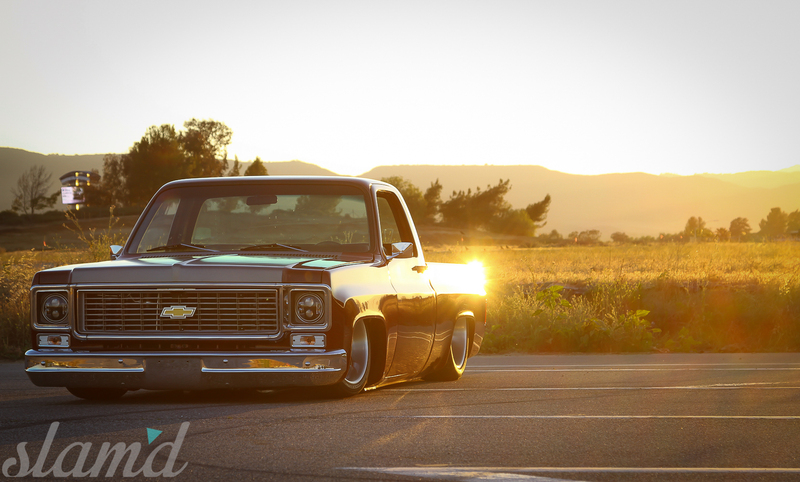 Larry dove at the opportunity head first and made history for his company behind the wheel of a tried and true classic. 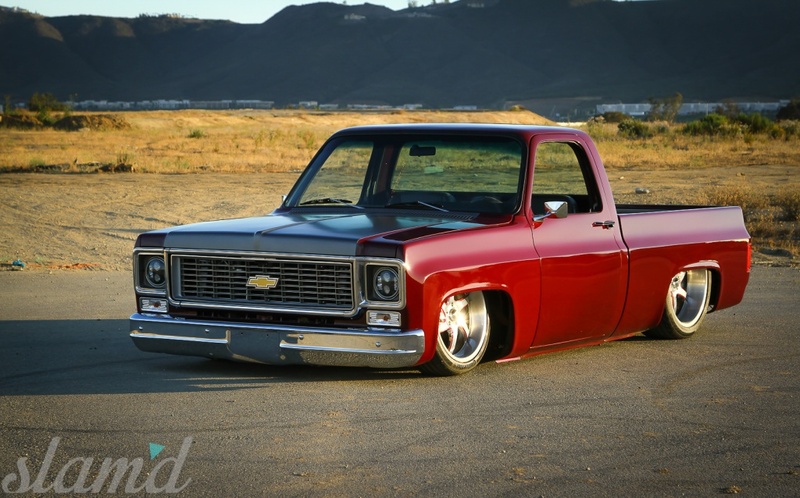 Underneath the TMI Square-body is a combination of readily available aftermarket support, and one-off custom fabrication. 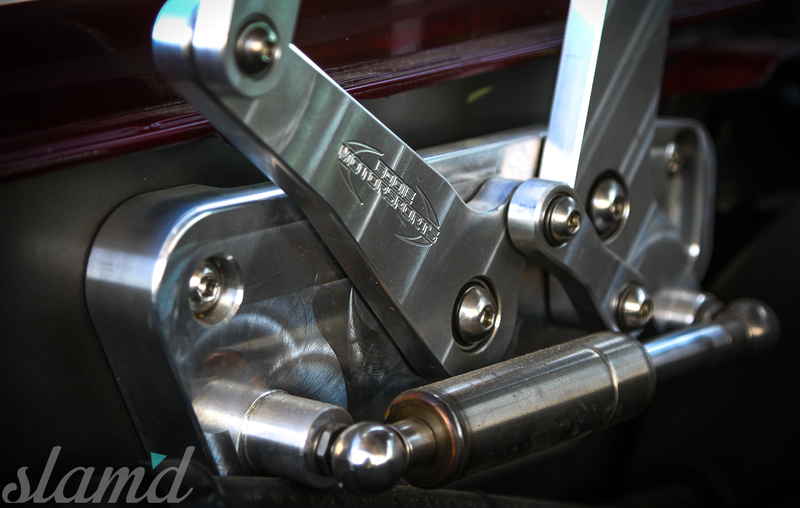 Fat Man Fabrication supplied the front-end suspension components. 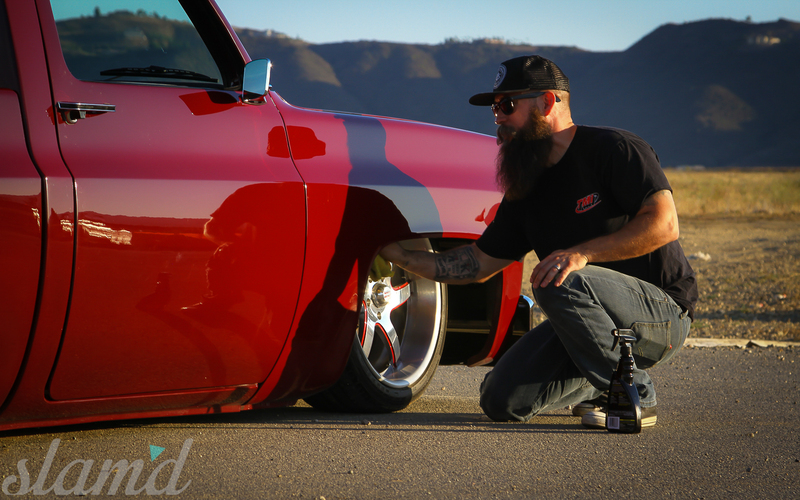 The IFS system utilizes custom control arms, 2-inch drop spindles, and Shockwave air suspension from Ridetech. 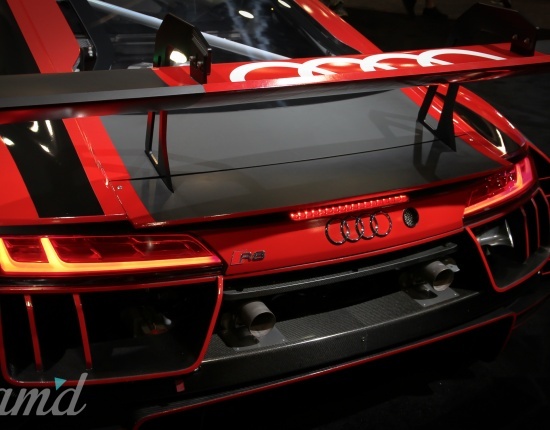 Ridetech also supplied the rear air bags, supporting components, and digital management system. 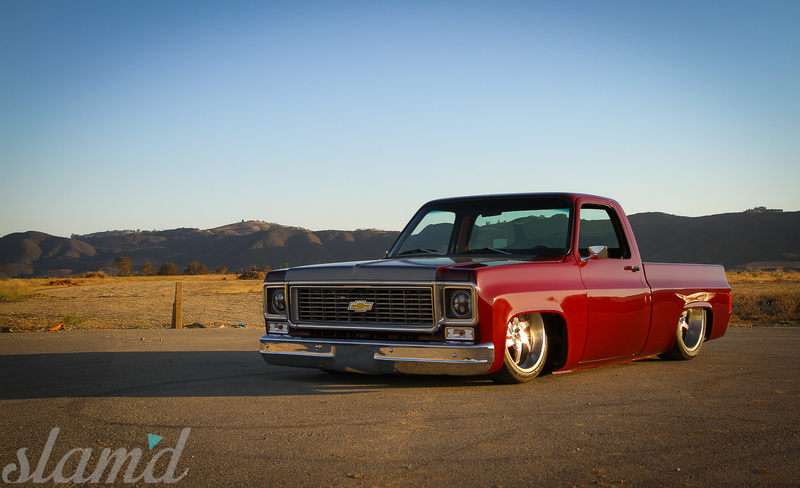 The 73’ lays frame thanks to the custom 4-link rear suspension and body drop performed by Max Fish of Bio Kustumz. 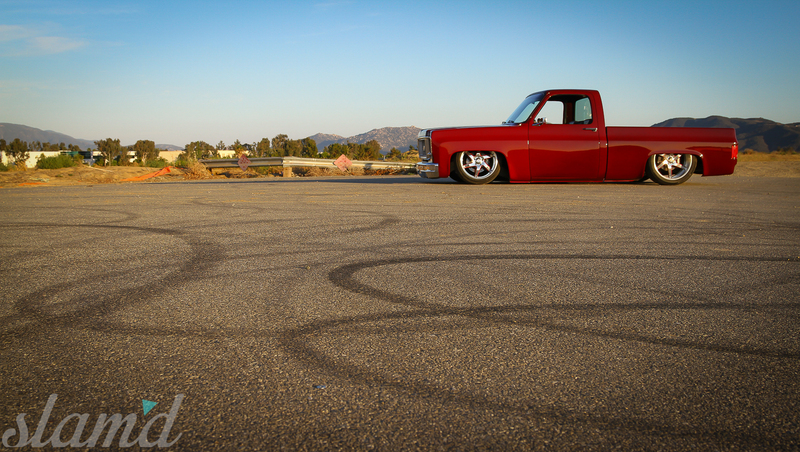 The truck was in progress at Max’s shop in Winchester, CA when Larry purchased it. 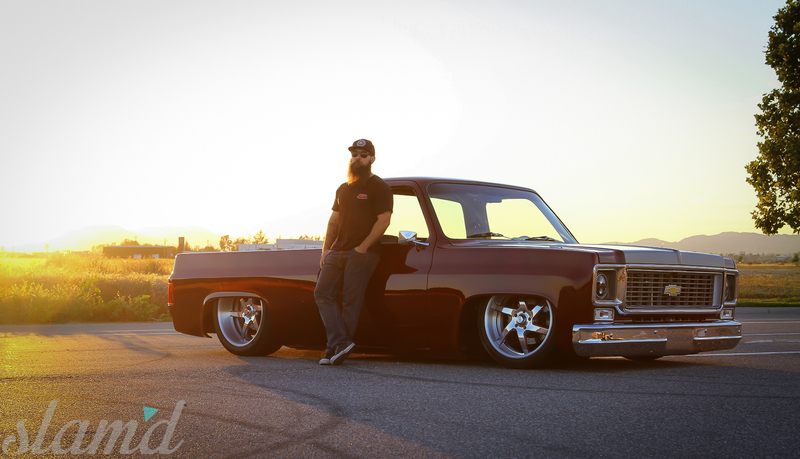 Max completed the suspension and custom bodywork before the truck was sent to Johnny’s Auto Color & Body Werxs for final body prep and paint. The Slam’d stance of the 73′ completely reimagines its visual presence. For TMI’s specific goals, this kind of dramatic change was absolutely vital. 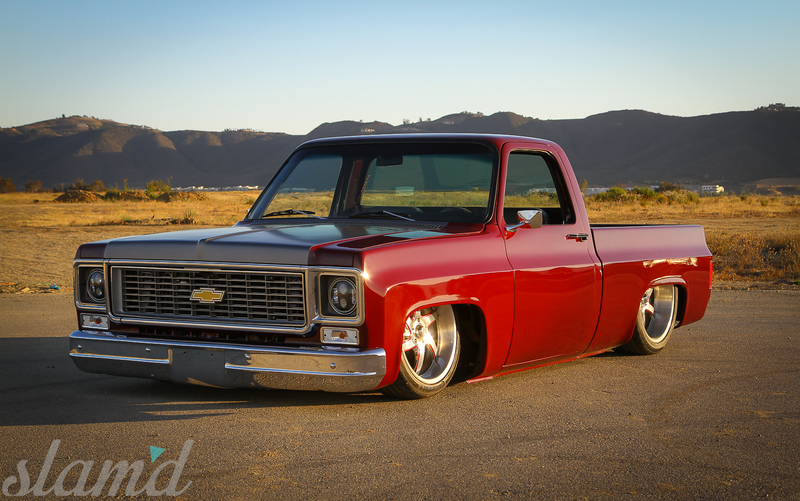 Their roll of the dice paid off in dividends as the C10 effectively carved out TMI’s corner of the classic truck market. Tucked high into the lowered wheel wells are American Racing VF485’s. The rollers are marked by their six blade-style spokes and color-matched finish. The convex formation of the blades allows for maximum exposed lip. 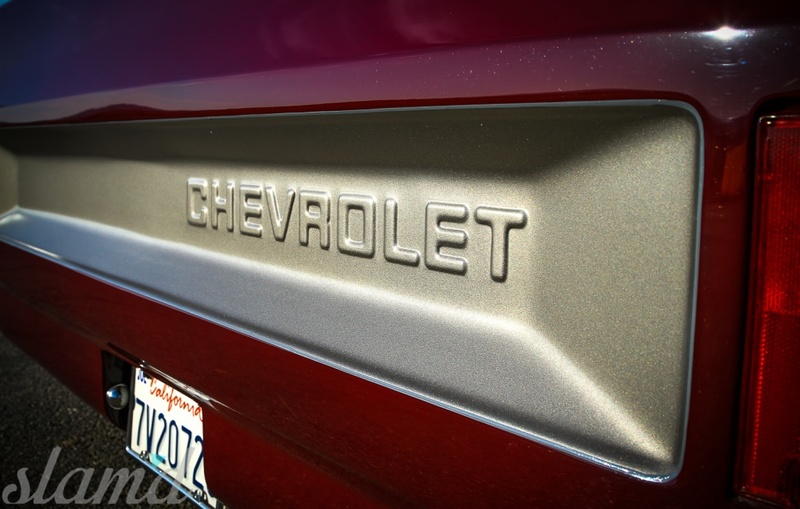 The machined surface is accented with paint matched chamfers. 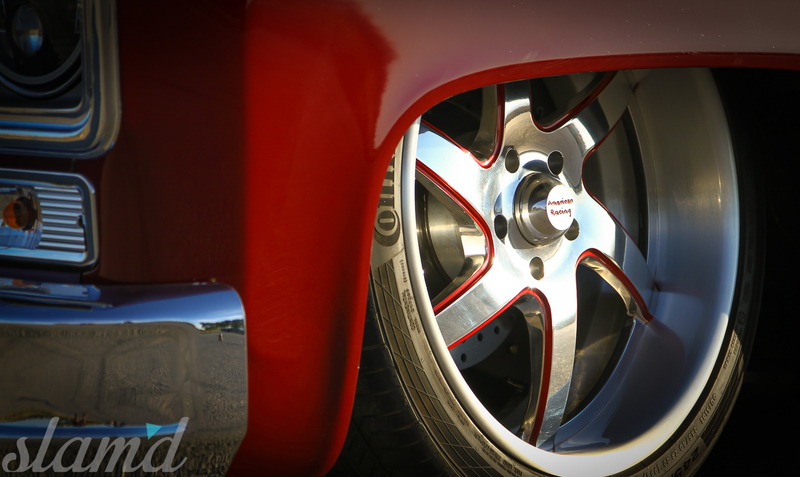 The wheels measure 20×8-inches in the front and 22×10-inches in the rear. 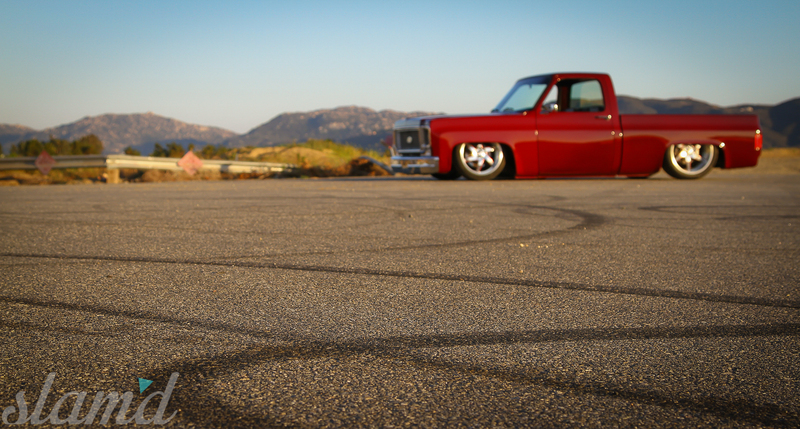 They are paired with Continental extreme-contact tires sized 255/35/20 and 285/40/22 respectively. Visible between the swirling blades are the Wilwood disc brakes, an add-on option for the Fat Man IFS. 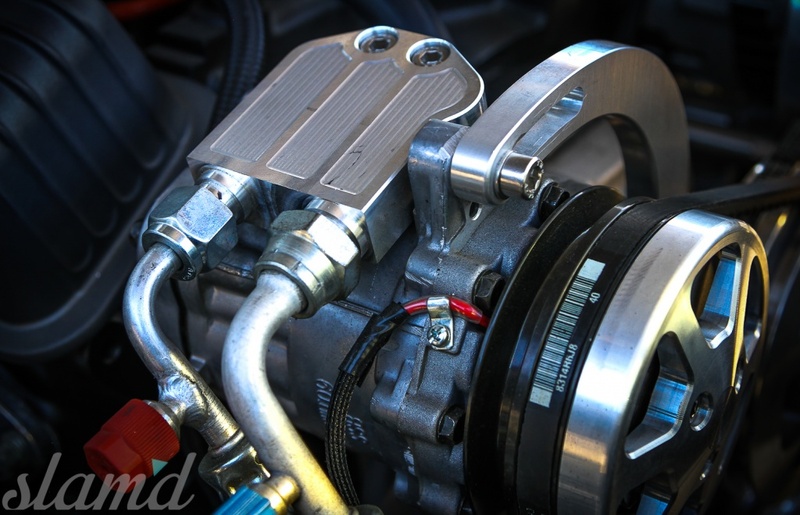 The big brake kit is managed by a matching billet master cylinder under the hood. 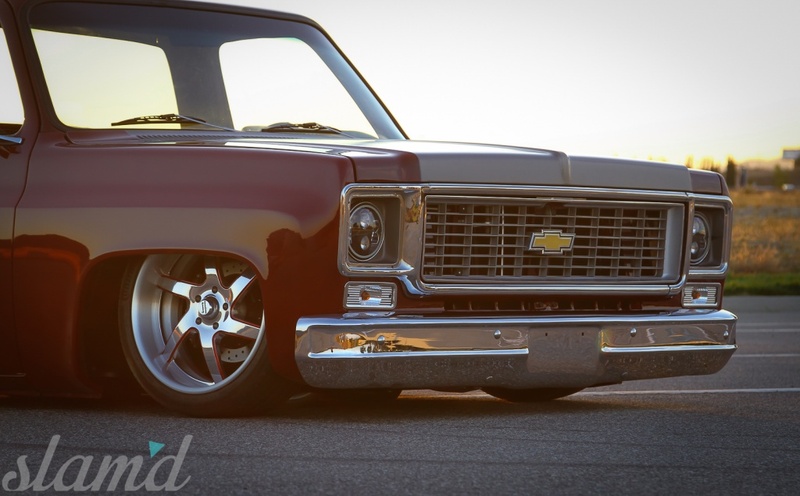 The drilled and slotted rotors provide an aggressive performance aesthetic and bring the muscle truck to an instant halt. 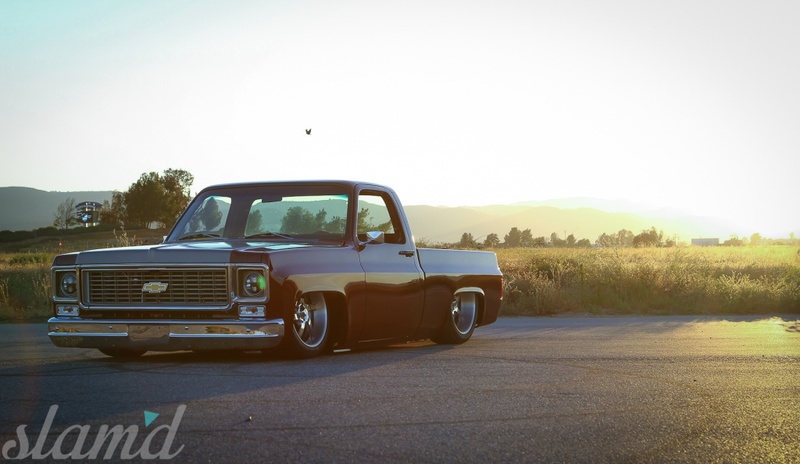 The choice of motor for TMI’s ’73 beautifully balances form and function. 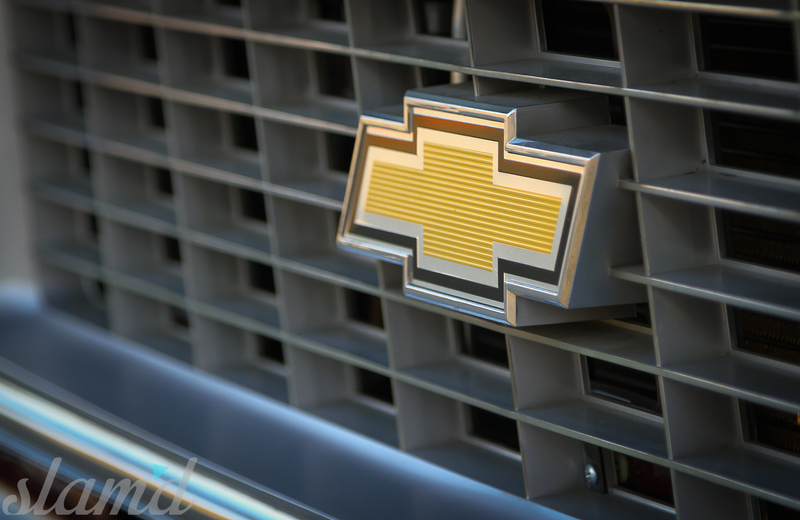 It utilizes a Chevy 327 V8. The engine was doctored and dressed by JH Restorations & Customs in Riverside, CA. JH applied a custom finned intake cover, AFE filter, Eddie Motorsports serpentine pulley system, and Painless Performance wiring system. 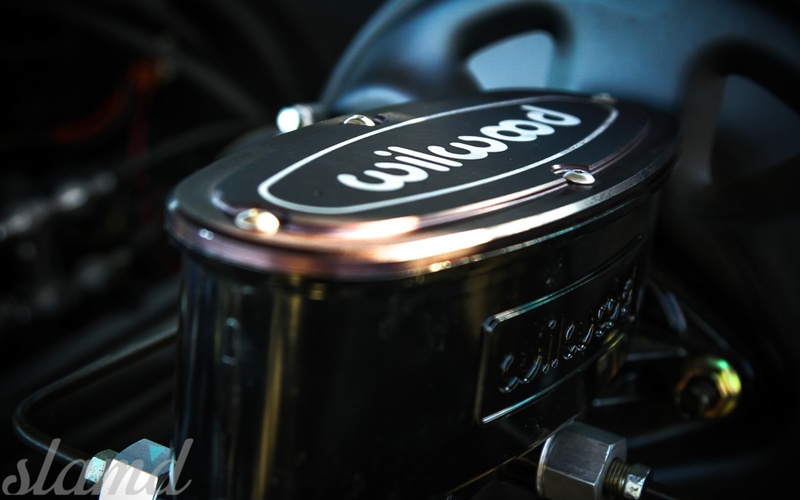 The finned intake cover matches with blacked-out valve covers. The engine’s appearance is modest and simple, favoring cleanliness as its means of showing off. 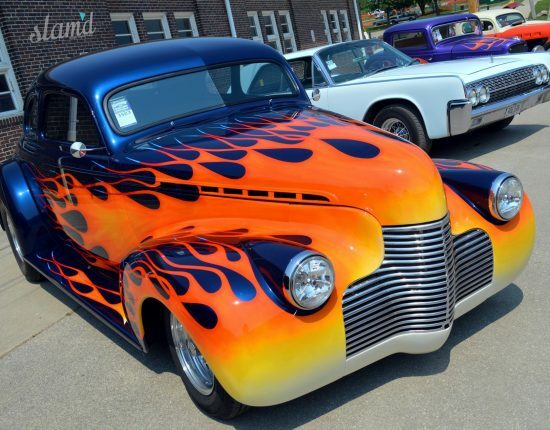 A bit of bolt-on power comes by way of Edelbrock carburetor, custom headers, exhaust, and Flowmaster mufflers. The V8 is hooked to a 700R4 trans. The power makes it’s way to an ultra-stout Currie Enterprises 9-inch rear end. 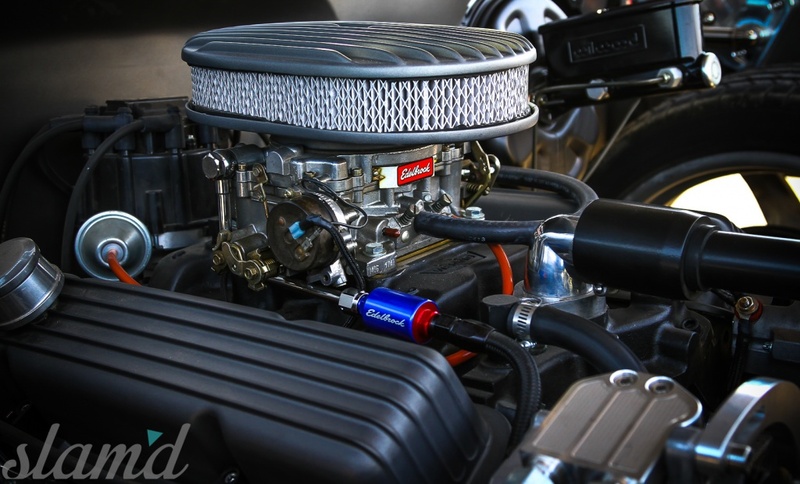 The powertrain is kept cool with a Champion Cooling Systems radiator. 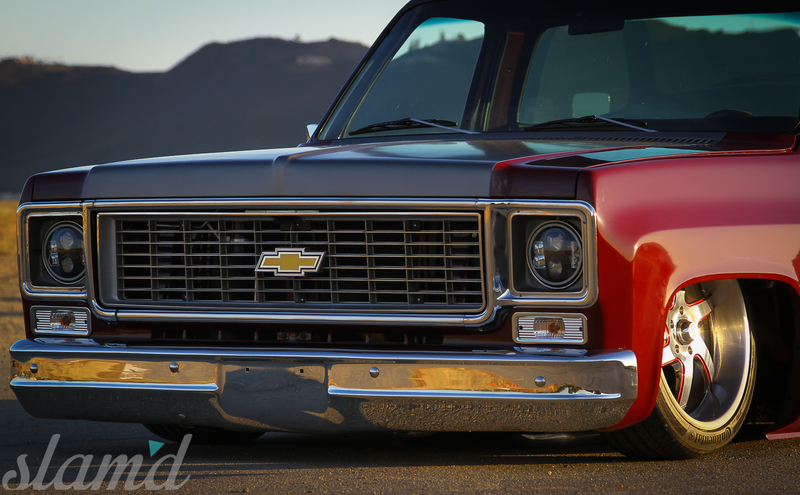 The look, feel, and sound of the rumbling small block help complete the effect that the ’73 captures. 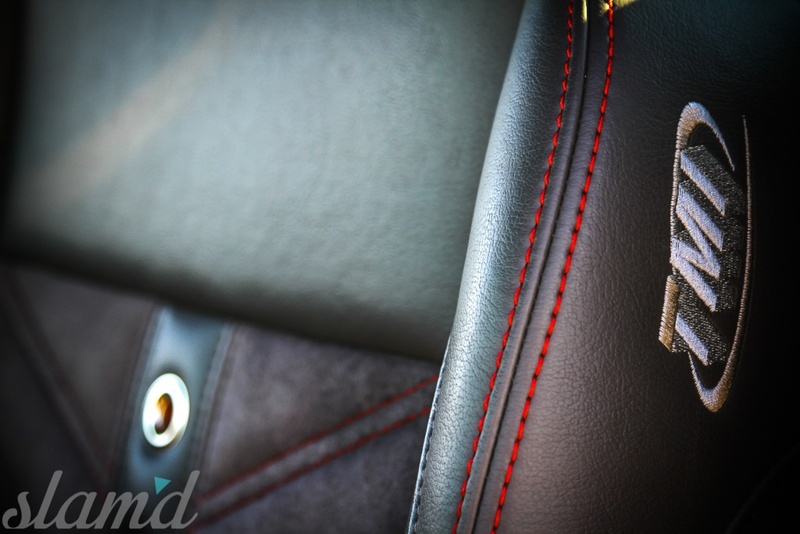 Furthering that look and feel is the immaculate bodywork and subtle details which set this square apart. The most obvious modifications come by way of the body drop and molded rear roll pan. The front bumper has also been altered and pulled in. A series of fine details truly push the envelope. In addition to the rain gutters having been shaved, the bedside and tailgate have both been tapered 4-inches. 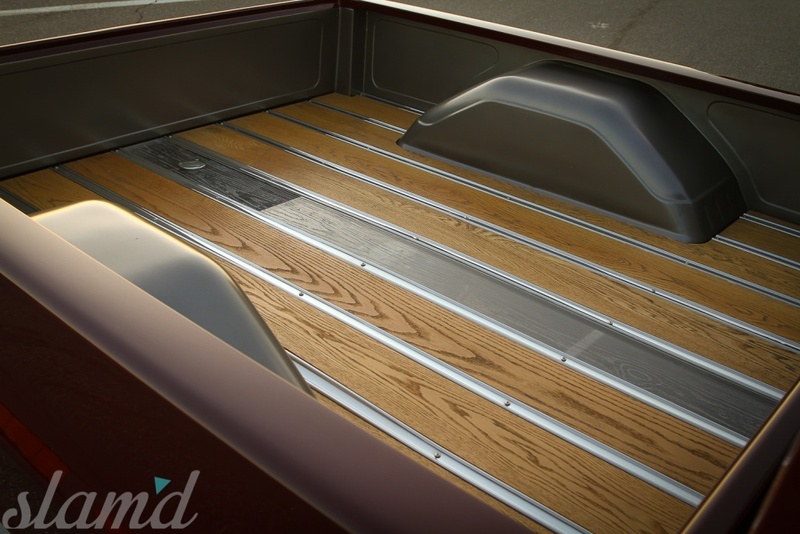 This allowed the tailgate to be fully molded to the bedsides, creating a seamless rear-end. Finally, the door-bottom corners have been rounded and smoothed. 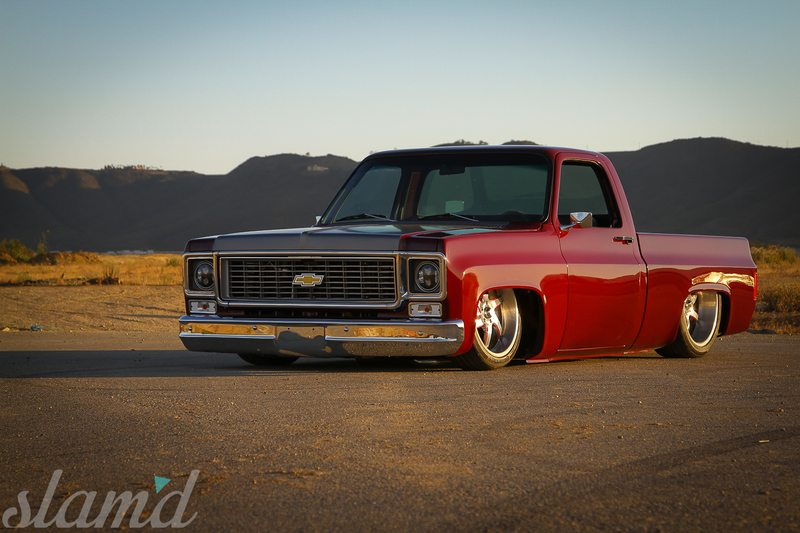 These all-metal mods give the TMI squarebody some one-of-a-kind body lines and define it as a custom work of art. 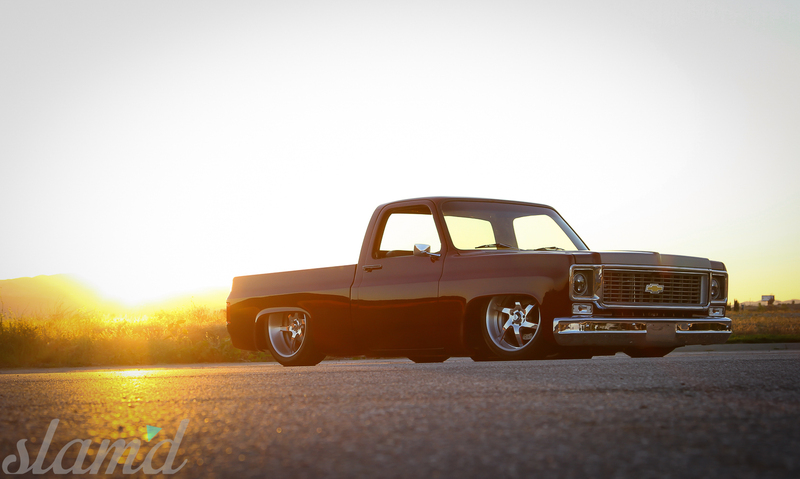 After the body prep was completed, the C10 was coated with PPG black base coat. The hood-center, inner bedside, and tailgate relief were all accented with PPG charcoal. 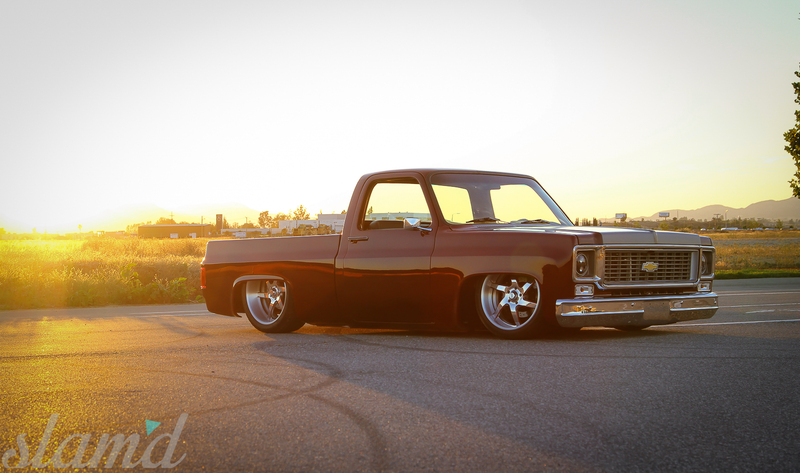 PPG burgundy toner was meticulously applied to the rest of the body. The finishing pinstripes were completed by hand, by John Hammond. 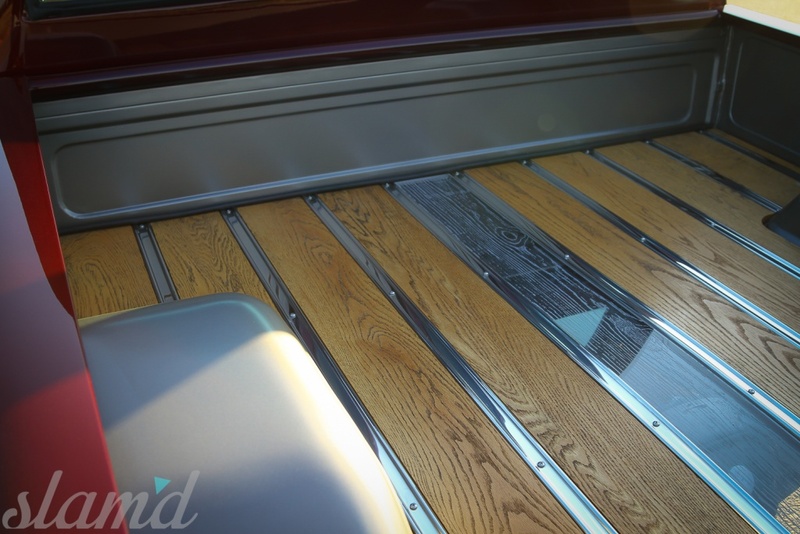 A handful of resto-mod updates come by way of HID projector headlights and custom wood and aluminum bed-floor with an etched plexiglass insert. 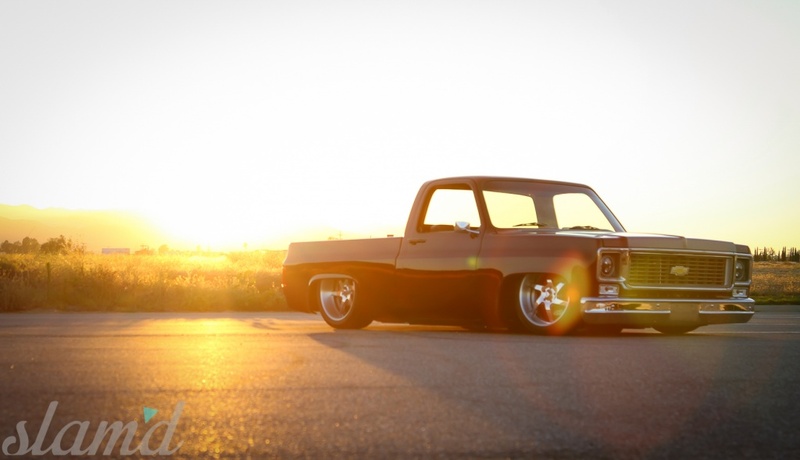 The crown jewel of this C10 is without a doubt its interior. 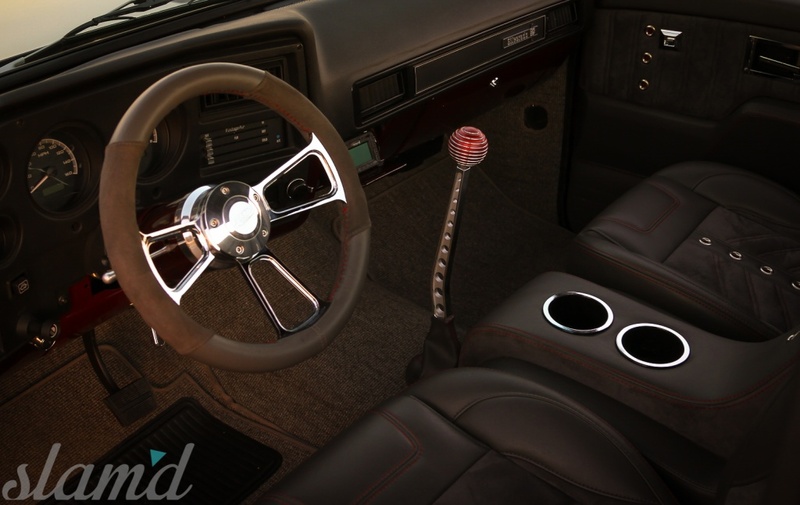 The SEMA 2015 project was TMI’s entry ticket to the classic truck interior market. 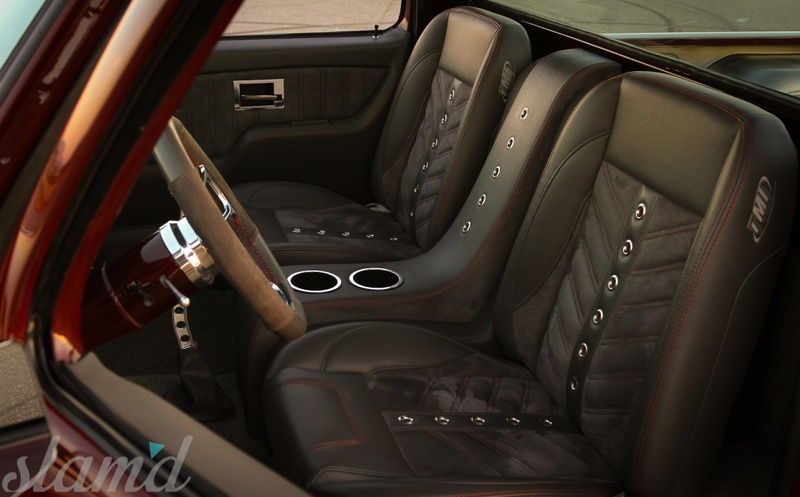 They knew just how much rode on a flawless interior execution. 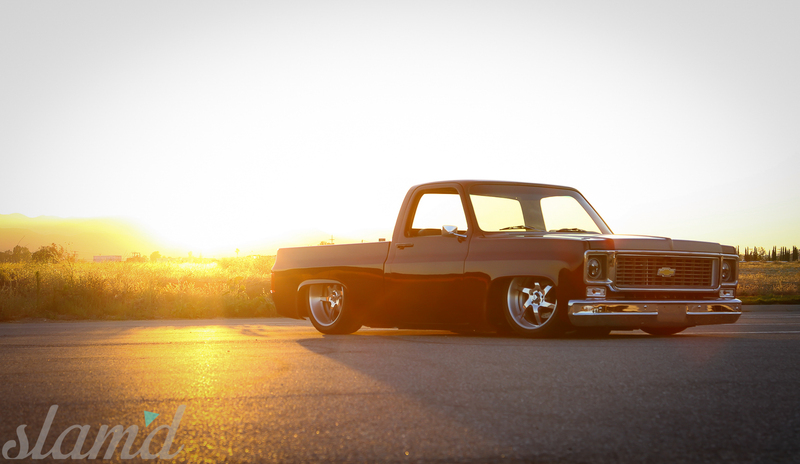 They began with a fully stripped and freshly painted cab. 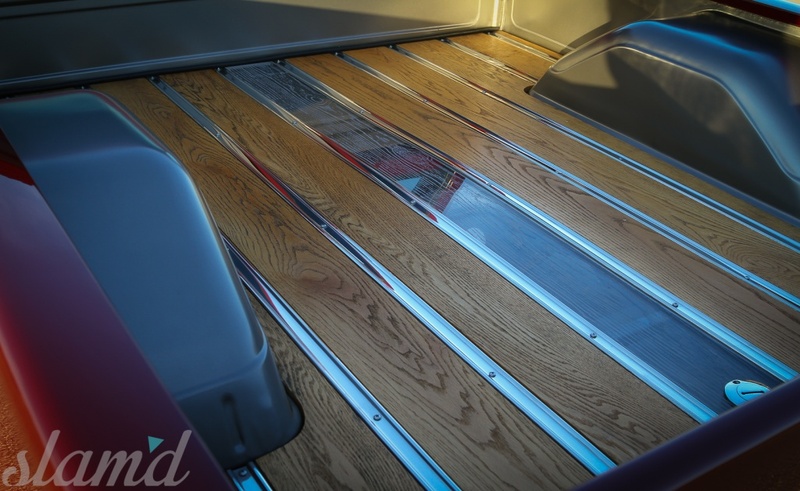 The first piece of the puzzle was the installation of QuietRide sound deadener. Next up, TMI selected their German square-weave carpeting, which is hand-cut NOT molded to ensure precise fitment. The burgundy and charcoal color scheme is continued throughout the interior. 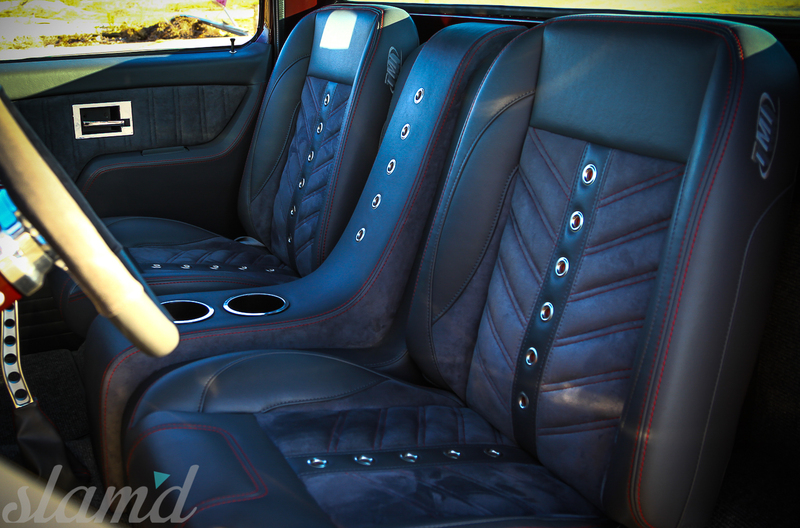 The seats are TMI’s Pro Classic Sport VXR complete buckets (they also offer bench configurations) with a waterfall center console. 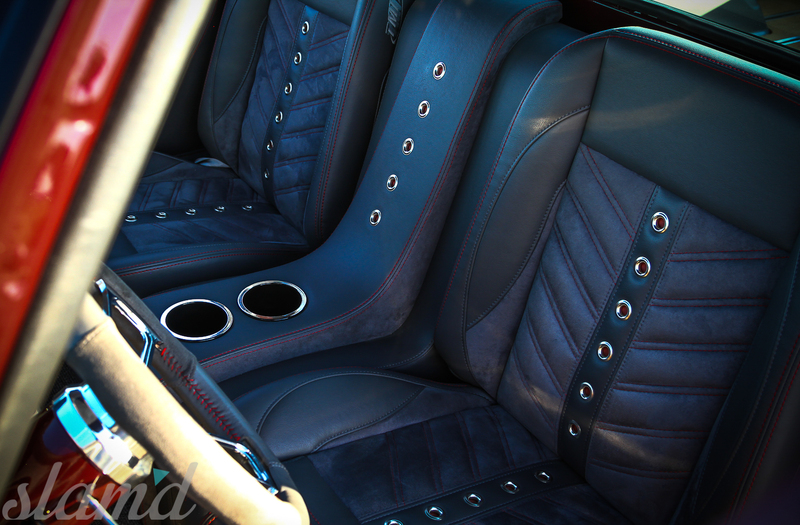 The seats and console are wrapped in a combination of charcoal suede and vinyl. Burgundy contrast stitch highlights the craftsmanship. Grommet speed accents provide aggressive visual cues. 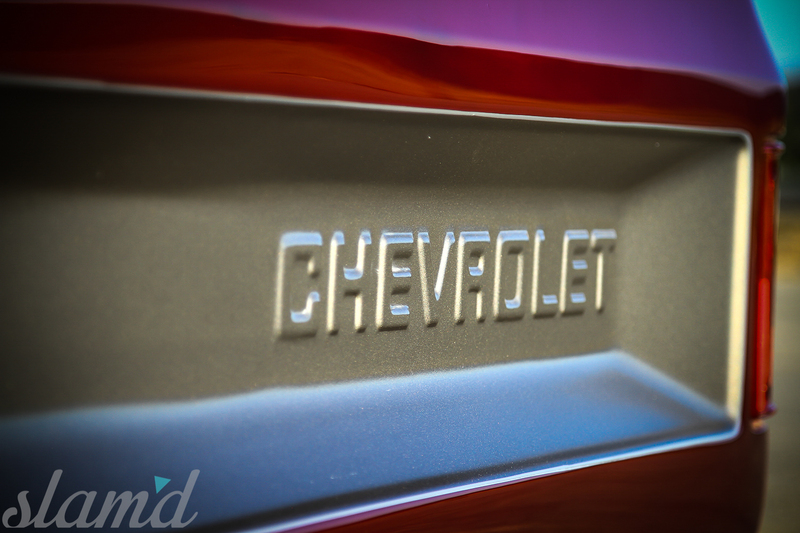 The TMI molded sport door panels, molded sport dash, and headliner are all designed to match seamlessly. The dash houses Dakota Digital gauges and a Retrosound head unit. The audio controller sends waves through a Retrosound amplifier and twin 8-inch subwoofers. The factory air vents pump ice-cold breeze thanks to the Vintage Air system. 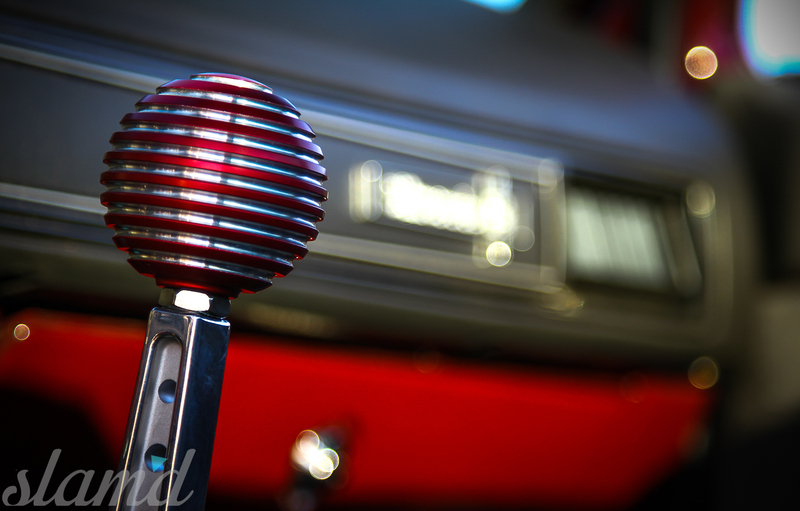 A floor-mounted Gennie Shifter is topped in a custom billet shift knob and of course the entire cabin is sealed right thanks to quality Precision Replacement Parts weather stripping. 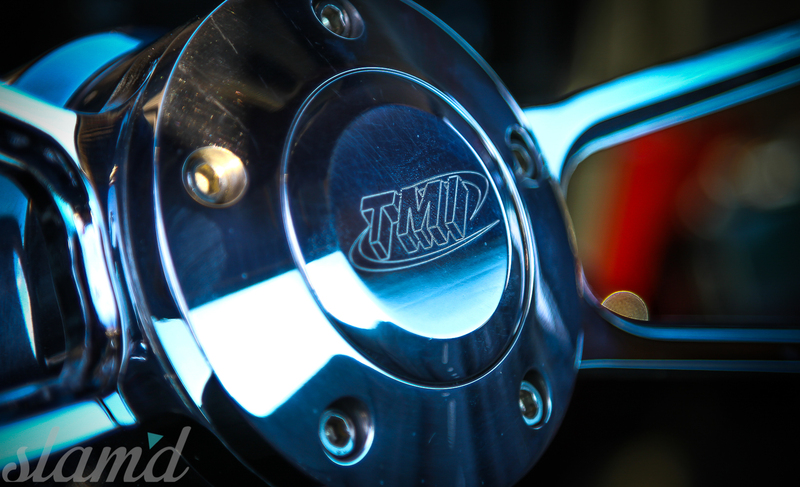 Finally, TMI’s signature billet and leather-wrapped steering wheel provides the finishing touch point. 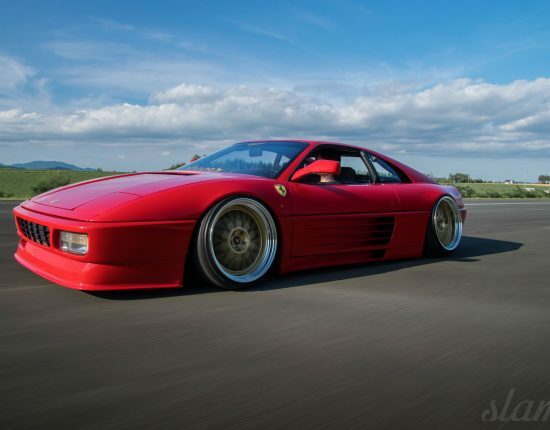 TMI’s gamble at SEMA paid off big time. With an incredibly well-rounded build, they were able to catapult themselves into uncharted market territories. The reception was warm, to say the least. TMI has continued to expand their support for the classic truck community. Larry Ashley, Waylon Krumrie and the team at TMI gained a valuable victory and #TeamSlamd gained another outstanding build!